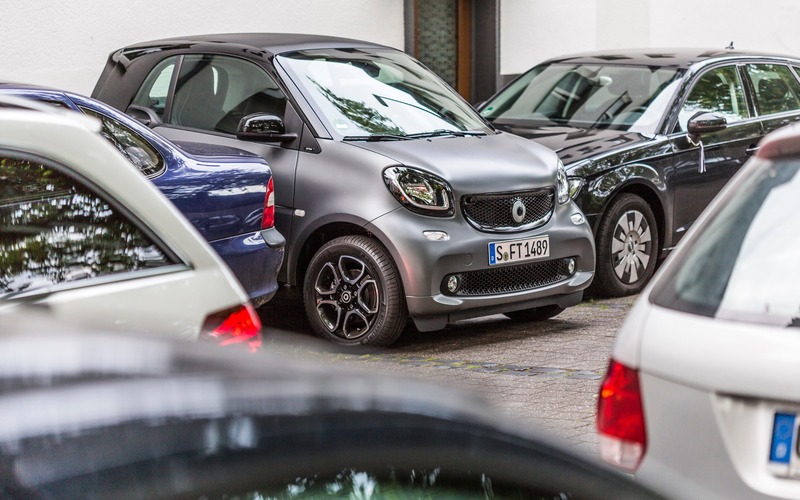 Mercedes-Benz brought us out to Germany’s densely populated city of Cologne for a first introduction to the new smart fortwo. Why Cologne? Because this is where the small urban vehicle is very popular, as it’s perfectly suited to the city’s narrow streets and heavy traffic. Whereas smarts are still a rarity in Canada, they’re ubiquitous in Cologne. Even though the smart fortwo has been fully overhauled, it nonetheless stays true to its roots. It’s essentially the same, only better in many regards, such as the livelier engine and significantly improved interior fit and trim. Built on the Renault Twingo platform, the smart sets the benchmark for compactness and remains the quintessential urban car. One of its bragging points is its super-tight 6.95-metre turning radius. There are three trim levels – Pure, Passion and Prime – and therefore three corresponding equipment levels. The smart has always been a cutie, but the new model kicks it up with more personality. In fact, it’s already earned a Red Dot Design Award. The front fascia is more expressive, while rounded fenders give it a more brawny appeal. And yet, its dimensions have hardly changed compared to the previous model. The vehicle’s length is the same, but the new fortwo is ever-so-slightly wider for better stability in corners. Even though the interior is still an intimate setting, they did add some distance between the driver and passenger. Once inside, you’ll notice they kept the dashboard’s funky style. One of the highlights is the running-shoe-like materials that cover part of it. Overall, it has a more high-end look. The multifunction steering wheel, which is height-adjustable but not telescopic, is swathed in leather on the Passion and Prime trims. The same leather envelops the Prime’s heated seats. The tach pod is propped atop the dashboard, and it’s the only aspect of the otherwise pleasant cabin that still looks a bit cheap. All trims come with a colour touch screen, automatic A/C system and Bluetooth connectivity. Meanwhile, cargo space is still scarce with just 260 litres of capacity. A cargo cover is included in the price. In North America, the smart’s only engine is a 898-cc three-cylinder turbo. It’s been enhanced to now deliver 89 horsepower (19 more than before) and 100 lb-ft of torque (compared to 60 in the past). The other noteworthy improvement is the optional six-speed dual-clutch transmission. The smart’s standard gearbox is a five-speed manual. When we tested the 2016 smart fortwo in Germany, they only let us try models with the dual-clutch transmission. It proved remarkably efficient and smooth, with no hint of the rocking-chair lurching that characterized the previous model and its slow, stubborn automatic transmission. That said, the vehicle’s performance is still just average. When the light turns green, it’s slow out of the starting blocks and the engine speed stays low. You don’t feel the torque until the revs climb to 2,500 rpm. What about fuel economy? We got an average of 7.3 L/100 km in mixed conditions, though it’s technically possible to get 6.5 L or less if you’re more disciplined about your driving style. The new model also offers an improved ride, in terms of handling and comfort. This is thanks to improved suspension clearance and more responsive steering. We should point out that all trims come with Crosswind Assist, which we first saw on the Sprinter. It uses selective braking to help mitigate the effects of crosswinds. Despite the numerous improvements, the smart isn’t going to defy the laws of physics anytime soon. At 1,873 millimetres, its wheelbase is super short and doesn’t always work in favour of the car’s ride. When you go over bumps, the jolts can be harsh. Plus, stability can be an issue if you brake suddenly and trigger the electronic stability control system. And yet, the short wheelbase and compact size make the smart fortwo an awesome city car. It glides through narrow streets with ease and has no problem negotiating heavy traffic. But when you release the brake and the Start-Stop system reactivates the three-cylinder engine, you’ll notice some fairly obvious vibrations coming through the cabin. In our country, the coupes will be the first to become available. The convertibles won’t show up until the second quarter of 2016, just in time for summer. They’ll be considered 2017 models. The new all-electric smart will follow toward the end of 2016. With the new smart, Mercedes-Benz should have no problem drawing back old customers, as the 2016 model rectifies several of the old model’s issues. What remains to be seen is whether or not it has what it takes to attract a new clientele. 9/10	Being good on gas has always been one of the smart fortwo’s strong points. 6/10	Just OK, despite the new suspension. 6/10	Noticeably better than the previous model’s performance, but the smart fortwo is still slow out of the starting blocks. 8/10	Now featuring an integrated smartphone dock and simplified connectivity. 7/10	Great for driving in the city, its natural habitat. 7/10	Many aspects have been much improved and the new fortwo will impress current smart owners.